CAIRO, JUNE 15, 2017 (WAFA) – The Arab League Thursday said Israel continues its repressive measures and grave violations of the Palestinian people and in violation of international law. In its report on Israel’s violations in May 2017, the Arab League said Israel arrested more than 370 Palestinians, including 50 children. Israeli authorities also razed approximately 100 dunums in Salifit and seized 9858 dunums in Jenin. Construction work continued outside the settlement blocs in the occupied West Bank, the report pointed out, especially in major Israeli settlements such as Gush Etzion in the southern West Bank, Ariel, and Ma’aleh Adumim, east of occupied Jerusalem. According to the report, the Israeli Knesset ratified the so-called “national law”, which aims to erase the Palestinian identity. Israel continued to forcibly displace Palestinians in East Jerusalem and impose a blockade on the Gaza Strip of the 11th year in a row. According to the non-governmental Israeli Macro Center for Political Economics, Israel has spent more than $ 20 billion on the construction and expansion of West Bank settlements, and Jerusalem since 1967. The report pointed out that that there are 600,000 settlers, including 400 thousand settlers in the West Bank, with their presence being a source of tensions with 2.6 million Palestinians in the West Bank and Jerusalem. The Israeli anti-settlement group Peace Now reported on bids and settlement plans that have been put forward for the year 2017. It said the percentage is three times larger than what was offered in 2016 of around 2,699 settlement units. 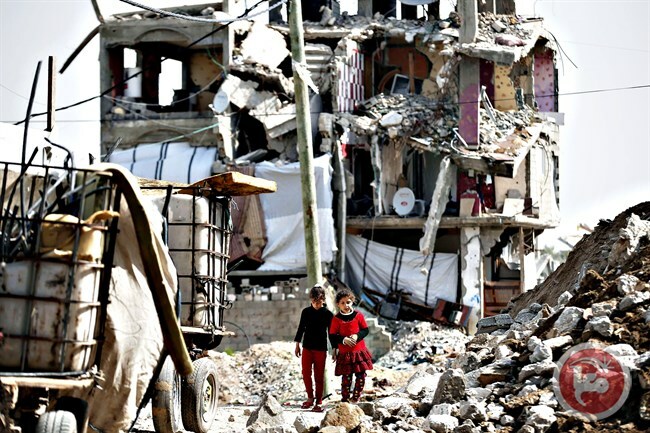 The report noted that the Gaza Strip has been severely, leading to an 80% increase in poverty due to the deterioration of economy and the worsening humanitarian crises. According to the World’s Bank 2016 report, unemployment rates in the Gaza Strip has jumped to 41.7%, the highest in the world. The report stated that Israel has resumed the construction of the separation wall around the village of al Walaja, south of occupied East Jerusalem, which will surround the village from all sides and completely isolate it from its geographical contiguity with its Palestinian. Israeli forces killed a Palestinian civilian in the Gaza Strip in new crime of excessive use of force. 21 Palestinian civilians, including 2 children, were wounded during peaceful demonstrations organized along the Gaza Strip borders. Israeli forces conducted 38 incursions into Palestinian communities in the West Bank and 3 limited ones in the Gaza Strip. 46 civilians, including 10 children, were arrested in the West Bank. 12 of them, including 6 children, were arrested in Jerusalem. Among those arrested were former Minister, Wasfi Qabha, and Hamas leader ‘Abdel Khaleq al-Natsheh. 5 civilians were arrested at military checkpoints in the West Bank. Israeli violations of international law and international humanitarian law in the oPt continued during the reporting period (08-14 June 2017). During the reporting period, in a new crime of excessive use of force, Israeli forces killed a Palestinian civilian and wounded 21 others, including 2 children, in the Gaza Strip. Israeli forces continued to chase the Palestinian fishermen in the Gaza Strip Sea and open fire at farmers along the border areas. In the Gaza Strip, on 09 June 2017, Israeli forces killed a Palestinian civilian and wounded 21 others, including 2 children, when the Israeli forces opened fire at dozens of young men protesting near the border fence between the Gaza Strip and Israel. In the northern Gaza Strip, those forces killed a Palestinian civilian and wounded 18 others, including 2 children. Five of whom were hit with bullets to the limbs, one was hit with bullet shrapnel to the chest, 10 were directly hit with gas canisters and 2 were hit with metal bullets. In the eastern side of al-Bureij refugee camp in the central Gaza Strip, two civilians were wounded with bullets to the limbs while in al-Shokah village, east of Rafah City in the southern Gaza Strip, a civilian was hit with a bullet to the limbs. In the context of Israeli attacks against fishermen in the sea, on 08 June 2017, Israeli gunboats opened fire at and chased Palestinian fishing boats sailing within 3 nautical miles northwest of Beit Lahia, north of the Gaza Strip. As a result, fishermen were forced to flee for fear of being arrested or killed. However, neither casualties nor damage to the boats were reported. The shooting recurred at the Palestinian fishing boats in the same area on 13 June 2017 when also fishing boats sailing off Rafah shore in the southern Gaza Strip were targeted in the same way. In the West Bank, Israeli forces used force to disperse protests organized by Palestinian civilians and human rights defenders in the villages of Ni’lin, Bi’lin, west of Ramallah, al-Nabi Saleh, northwest of the city, and Kafr Qaddoum, northeast of Qalqilya. As a result, some protestors suffered tear gas inhalation while others sustained bruises after being beaten up by the Israeli soldiers. During the reporting period, Israeli forces conducted at least 38 military incursions into Palestinian communities in the West Bank, and 7 others into Jerusalem and its suburbs .During these incursions, Israeli forces arrested at least 46 Palestinian civilians, including 10children. Fourteen of them, including 6 children, were arrested in occupied Jerusalem and its suburbs. Among those arrested were ‘Abdel Khaleq al-Natsheh (62), a Hamas leader, and Wasfi Qabha, a former Minister. The Israeli forces also confiscated a carr belonging to al-Natsheh’s wife and another car belonging to Hadil Abu Menshar. The Israeli forces claimed that the two confiscated cars belong to Hamas movement while both al-Natsheh and Abu Menshar families confirmed they bought those cars from their own money. In the Gaza Strip, on 12 June 2017, Israeli forces moved 100 meters into al-Qararah village, northeast of Khan Younis, south of the Gaza Strip. They combed lands along the border fence between Israel and the Gaza Strip. At approximately 01:00, Israeli forces moved into al-Khader village, south of Bethlehem. They raided and searched a house belonging to Eyad Abu al-‘Ourah (24) and then arrested him. At approximately 02:00, Israeli forces moved into Jabal Abu Romman in the southern area of Hebron. They raided and searched a house belonging to Anwar Mohammed Abu Husain (44) and the house of his brother Husain (34). They then withdrew, and no arrests were reported. At approximately 02:30, Israeli forces moved into ‘Inabous village, south of Nablus. They raided and searched a house belonging to lawyer Mohammed Naser Eden ‘Ellan (32) and then arrested him. Around the same time, Israeli forces moved into Madama village, south of Nablus. They raided and searched several houses and then arrested Ahmed Nezar Zeyadah (22) and Oseid Abdul Naser al-Qet (24). Around the same time, Israeli forces moved into Taqqou’ village, southeast of Bethlehem. They raided and searched a house belonging to Mohanned Jamal Jahajhah (20) and then arrested him. At approximately 22:00, Israeli gunboats stationed offshore, northwest of Beit Lahia village in the northern Gaza Strip, opened fire at Palestinian fishing boats sailing within 3 nautical miles and chased them. As a result, the fishermen were forced to flee fear for his life, but neither casualties nor material damage were reported. Note: During the aforementioned day, Israeli forces conducted (3) incursions in the following areas and no arrests were reported: Tarqumiya village and Dura in Hebron and Howarah village, south of Nablus. At approximately 02:50, Israeli forces moved into Wad al-Haryah area in the southern area in Hebron. They raided and searched a house belonging to Abdul Khaleq Hasan Shathli al-Natshah (62), a Hamas leader, and then arrested him. They also confiscated his wife’s car, which cost about NIS 110,000. The soldiers handed the family a decision to confiscate the vehicle with words of:” money belonging to Hamas Movement”. “A number of soldiers raided our house and thoroughly searched my husband’s library and then handcuffed him. The soldiers refused to allow me to give him his own medicine before they withdrew. They then confiscated my car though I showed them papers that prove it belongs to me, but they did not care and said it is for Hamas. After the soldiers left the house, I checked on the house and found jewelry estimated about JD 2000 and about NIS 500 missed from my wallet. The wallet was in the bedroom where the soldiers were searching without allowing us to come with them. I knew later that my husband is in Megiddo Prison”. In the same time, another Israeli force raided and searched a house belonging to Derar Mohammed Rabei’ Zuhdi Abu Monshar (38) from al-Rahmah area in the southern area of the city, and arrested him. They also confiscated the car of Derar’s wife Hadeel Abu Menshar (32). It should be noted that the car costs about NIS 50,000 and Hadeel bought it after she got the inheritance of her family. Note: During the aforementioned day, Israeli forces conducted (3) incursions in the following areas and no arrests were reported: Qalqiliyah Beit Awa village and Qalqas area in Hebron. At approximately 04:30, Israeli forces moved into Surif village, northwest of Hebron, and stationed in al-Baten neighbourhood. They raided and searched 2 houses belonging to Khaled Ahmed ‘Ar’ar (22) and Omer Mohammed Ghuneimat (26) and then arrested them. At approximately 06:00, an Israeli infantry force moved into al-‘Aroub refugee camp, north of Hebron. The soldiers patrolled the streets and then raided and searched 4 houses. They then arrested 4 civilians namely Rebhi Jaber Khamis al-Badawi (33), Ema Mahmoud Abdul Rahamn Jabrin (28) and the brothers Fathi (26) and Tareq Khamis al-Badawi (23). Note: During the aforementioned day, Israeli forces conducted (3) incursions in the following areas and no arrests were reported: ‘Azoun village, east of Qalqiliyah, Halhoul and Beta village, south of Nablus. At approximately 06:00, an infantry Israeli force raided a house belonging to Ahmed Hani Da’nah (15), in the center of Hebron’s Old City, and arrested him. Few hours later, Ahmed was released and handed to the Palestinian Military Liaison. Note: During the aforementioned day, Israeli forces conducted (3) incursions in the following areas and no arrests were reported: al-Fawar refugee camp and Yatta, south of Hebron, and Howarah village, south of Nablus. At approximately 02:00, Israeli forces moved into They raided and searched a house belonging to Khalil Mo’ti (54) and then arrested him. At approximately 03:00, Israeli forces moved into Jenin. They raided and searched a house belonging to the former Minister of Prisoner Affairs, Wasfi Qabha (30) and then arrested him. At approximately 03:30, Israeli forces moved into Rantees village, northwest of Ramallah. They raided and searched several houses and then arrested Sa’eb Fehmi Abu Saleem (29) and Soheib Jamil al-Sheikh (28). At approximately 05:00, Israeli forces moved into Beit Ummer village, north of Hebron. They raided and searched a number of houses and then arrested Mohammed ‘Essa Mohammed Bahar (17) and Mohammed Yusuf Mohammed Bahar (22) and took them to the village entrance where a military watchtower is stationed. In the meanwhile, another Israeli force raided a medical clinics building after breaking the main building door. The soldiers searched two clinics belonging to Basel Abu Dayah and Dr. Hasan al-‘Alami. At approximately 07:00, Israeli forces accompanied with a number of heavy military bulldozers moved about 100 meters into the eastern side of al-Qararah village, northeast of Khan Yuns in the southern Gaza Strip. The bulldozers leveled the lands along the border fence for hours before they redeployed along the abovementioned border fence. Note: During the aforementioned day, Israeli forces conducted (3) incursions in the following areas and no arrests were reported: Sa’ir, Beit Awla and al-Shyoukh villages in Hebron. At approximately 02:00, Israeli forces moved into Tulkarm. They raided and searched several houses after which they arrested Fadi Ahmed Mustafa ‘Amouri (40) and ‘Adnan Ahmed Hasan Khader (49). At approximately 03:00, Israeli forces moved into Shweikeh Suburb, north of Tulkarm. They raided and searched a number of houses and ten arrested Mohammed Abdul Rahman Rashed Akabriyah (30). At approximately 04:00, Israeli forces moved into Tarqumiyah village, west of Hebron. They raided and searched a house belonging to Netham Abdul Rahman Qa’aqout (47) and then arrested him. At approximately 04:40, Israeli forces moved from “Beit Eil” settlement into al-Jalazoun refugee camp, north of Ramallah and the soldiers deployed between houses. A number of Palestinian young men gathered and threw stones at the soldiers. The soldiers fired sound bombs and tear gas canisters at them and chased them. They also arrested Mohammed Sa’ed Shahwan (21). At approximately 05:00, Israeli forces moved into Yatta, south of Hebron, and stationed on Roq’ah neighborhood. They raided and searched a house belonging to Bahaa’ Khalil Ibrahim Zain (36) and then withdrew, but no arrests were reported. At approximately 22:30, Israeli gunboats fired shells and opened fire at Palestinian fishing boats sailing off Rafah shore in the southern Gaza Strip. They also fired flare bombs above the fishermen’s boats, but no arrests were reported. At approximately 23:15, Israeli gunboats stationed offshore, northwest of Beit Lahia village in the northern Gaza Strip, opened fire at Palestinian fishing boats sailing within 3 nautical miles and chased them. As a result, the fishermen were forced to flee fearing for their lives. However, neither casualties nor material damage were reported. Note: During the aforementioned day, Israeli forces conducted (3) incursions in the following areas and no arrests were reported: al-Shyoukh and Beit Marsam villages in Hebron and Beta village, southeast of Nablus. At approximately 03:00, Israeli forces moved into Husan village, west of Bethlehem. They raided and searched a house belonging to Mohammed Nabil al-Sha’er (22) and then arrested him. At approximately 07:00, Israeli forces moved into al-Dheisheh refugee camp, south of Bethlehem. They raided and searched several houses and then arrested Younis Hasan al-Zughari (22) and Mo’taz Mohammed Shari’ah (22). At approximately 03:10, Israeli forces moved into al-Jalazoun refugee camp, north of Ramallah. They raided and searched a house belonging to Qeis Ra’ed Barakat (17) and then arrested him. Around the same time, Israeli forces moved into al-Birah and stationed in al-Jenan area. They raided and searched a house belonging to Ahmed Mohammed Hawamdah (22) and then arrested him. Following the Friday prayer on 09 June 2017, dozens of Palestinian civilians and Israeli and international human rights defenders organized a protest in Bil’in and Ni’lin villages, west of Ramallah; al-Nabi Saleh village, northwest of the city and Kufor Qaddoum village, northeast of Qalqiliyah, in protest against the annexation wall and settlement activities. Israeli forces forcibly dispersed the protests, firing live and metal bullets, tear gas canisters and sound bombs. They also chased protesters into olive fields and houses. As a result, some of the protesters suffered tear gas inhalation while others sustained bruises as Israeli soldiers beat them up. At approximately 17:00 on Thursday, 08 June 2017, dozens of Palestinian young men gathered near the border fence between the Gaza Strip and Israel, east of al-Qararah village, northeast of Khan Yunis in the southern Gaza Strip. They set fire to tires and raised the Palestinian flags and banners condemning the Israeli closure on the Gaza Strip. When a number of the young men approached the abovementioned border fence, the Israeli soldiers stationed there sporadically fired live bullets and tear gas canisters for an hour and a half around the protestors to disperse them. As a result, a number of them sustained tear gas inhalation. Around the same time, dozens of Palestinian young men gathered near the border fence between the Gaza Strip and Israel, east of Khuza’ah village, east of Khan Yunis in the southern Gaza Strip. They set fire to tires and raised flags and banners condemning the Israeli closure on the Gaza Strip. When some of the young men approached the abovementioned border fence, the Israeli soldiers stationed there sporadically fired live bullets and tear gas canisters for an hour and a half around the protestors to disperse them. As a result, some of them sustained tear gas inhalation. Around the same time, dozens of Palestinian young men made their way to the border fence between the Gaza Strip and Israel, east of al-Buraij, in protest against the Israeli-imposed closure on the Gaza Strip. The young men gathered near the security fence, set fire to tires, raised the Palestinian flags and then threw stones at the Israeli soldiers stationed along the border fence. The soldiers fired live bullets and tear gas canisters at the protestors and the agricultural lands located to the west of the abovementioned border fence. As a result, a number of civilians suffered tear gas inhalation and received medical treatment on the spot. At approximately 14:30 on Friday, 09 June 2017, dozens of youngsters gathered near the border fence, east of the cemetery, east of Jabalia in the northern Gaza Strip. Some of them set fire to tires and threw stones at Israeli soldiers stationed behind the border fence. The Israeli soldiers sporadically fired tear gas canisters and live bullets at the protestors for 5 hours. The confrontations peaked at 18:00. As a result, ‘Ayed Khamis Mahmoud Jom’ah (19) from Jabalia died after he sustained a live bullet wound to the head. In addition, 18 civilians, including 2 children, were wounded, when they were between 50 and 150 meters away from the border fence. Six civilians were hit with live bullets to the limbs, one sustained a live bullet shrapnel wound to the chest, 9 civilians were directly hit with tear gas canisters and 2 others sustained live bullet wounds. The killed and wounded were transferred by ambulances, civilian vehicles and even motorcycles to the Indonesian Hospital in Jabalia. The medical sources classified their injuries between moderate and minor. (PCHR keeps the names of the wounded civilians). At approximately 03:30 on the same Friday, dozens of Palestinian civilians gathered few meters away from the border fence between the Gaza Strip and Israel near al-Nahdah neighborhood, east of al-Shawkah village, east of Rafah in the southern Gaza Strip, in response to calls for protests in the border area against the Israeli-imposed closure on Gaza. A number of the protestors approached the border fence, set fire to tires, raised the Palestinian flags and then threw stones at the Israeli soldiers stationed at the border fence. The soldiers fired tear gas canisters and live bullets at them. The clashes continued until approximately 19:00 on the same day. As a result, Mohammed Yasin Ahmed al-‘Arabid (21) sustained a live bullet wound to the upper limbs. He was transferred to Gaza European Hospital in Khan Yunis. His injury was classified as moderate. At approximately 17:00 on the same Friday, dozens of Palestinian young men made their way to the border fence between the Gaza Strip and Israel, east of al-Buraij, in rejection to the Israeli-imposed closure on the Gaza Strip. The young men gathered near the security fence, set fire to tires, raised the Palestinian flags and then threw stones at the Israeli soldiers stationed at the border fence. The soldiers fired live bullets and tear gas canisters at the protestors and the agricultural lands that are located in the west of the abovementioned border fence. As a result, 2 civilians sustained live bullet wounds to the limbs. One of the wounded civilians was in his land that is located about 220 meters away from the abovementioned border fence. Moreover, other civilians sustained tear gas inhalation. The wounded civilians were transferred to al-Aqsa Hospital to receive medical treatment. Their injuries were classified as moderate. At approximately 17:00 on the same Friday, dozens of Palestinian young men made their way to the border fence between the Gaza Strip and Israel, east of Khuza’ah village, east of Khan Yunis in the southern Gaza Strip. They set fire to tires, raised the Palestinian flags and banners condemning the Israeli closure on the Gaza Strip. When a number of the young men approached the border fence waving the Palestinian flags, the Israeli soldiers stationed there sporadically fired live bullets and tear gas canisters at them for an hour and a half in order to disperse the protestors. As a result, a number of civilians sustained tear gas inhalation. Note: PCHR apologizes for not publishing the data relevant to this crossing because it was not prepared by the competent authority. It will be published next week. On Thursday, 08 June 2017, Israeli forces established 4 checkpoints at the entrances to Bani Na’iem and Samou’a villages; at the entrance to al-‘Aroub refugee camp; and at the eastern entrance to Halhoul village. On Friday, 09 June 2017, Israeli forces established 2 checkpoints at the entrances to Sa’ir and Samou’a villages. On Saturday, 10 June 2017, 3 similar checkpoints were established at the southern entrance to Halhoul; at the northern entrance to Hebron; and at the northern entrance to Yatta village. On Monday, 12 June 2017, Israeli forces established 4 checkpoints at the entrances to Deir Zirdah and Ethna villages; at the northern entrance to Hebron and at the southern entrance to Halhoul village. At approximately 12:00 on Thursday, 08 June 2017, Israeli forces established a checkpoint at the intersection of al-Taiba village, northeast of Ramallah (on al-Mo’arajat road between Ramallah and Jericho). At approximately 16:00 on Friday, 09 June 2017, Israeli forces established a checkpoint at the intersection of al-Taiba village, northeast of Ramallah (on al-Mo’arajat road between Ramallah and Jericho). At approximately 21:10 on Sunday, 11 June 2017, Israeli forces established a checkpoint at the entrance to al-Nabi Saleh village, northwest of Ramallah. Around the same time, a similar checkpoint was established in ‘Atara village’s bridge, north of the city. At approximately 21:30 on Monday, 12 June 2017, Israeli forces established a checkpoint at the entrance to Ni’lin village, west of Ramallah. Around the same time, a similar checkpoint was established near the intersection of ‘Oyoun al-Haramiyia area ( on the main road between Ramallah and Nablus). At approximately 06:10 on Thursday, 08 June 2017, Israeli forces established a checkpoint at the northern entrance to Jericho. At approximately 15:30 on Friday, 09 June 2017, Israeli forces established a checkpoint at the southern entrance to Jericho. They searched civilians’ vehicles and checked their IDs. It should be noted that the checkpoint was established for 4 hours consecutively. On Friday, 09 June 2017, Israeli forces established 2 checkpoints at the eastern entrance to Qalqiliyia and at the entrance to ‘Azoun village, east of the city. At approximately 14:15 on Saturday, 10 June 2017, Israeli forces established a checkpoint at the southern entrance to Qalqiliya. At approximately 21:30, the checkpoint was established again. At approximately 22:30, Israeli forces established similar checkpoint at the entrance to ‘Izbit al-Tabeeb, east of the city. At approximately 20:40 on Monday, 12 June 2017, Israeli forces established a checkpoint at the entrance to Jeet village, northeast of Qalqiliyia. At approximately 00:30 on Tuesday, 13 June 2017, a similar checkpoint was established at the eastern entrance to Qalqiliyia. On Friday, 09 June 2017, Israeli forces established 3 checkpoints at the entrance to Kaful Hares, north of Salfit (was established twice) and at the northern entrance to Salfit. At approximately 16:00 on Thursday, 08 June 2017, Israeli forces stationed at al-Nashash checkpoint in al-Khadir village, south of Bethlehem, arrested Mofti al-Masri (26) and Yousef Sarahnah (28). Both of them are from al-Dahisha refugee camp, south of the city. At approximately 19:20 on Saturday, 10 June 2017, Israeli forces established a checkpoint at the entrance to al-Nabi Iyyas village, east of Qalqiliya. They searched the Palestinian vehicles and checked passengers’ IDs. During this, they arrested ‘Amer Mohamed Abed al-Rahman Friaj (25) and Mjtahid Tahseen ‘Abdouh (28). At approximately 22:00, Israeli forces stationed at al-Kontainer checkpoint, northeast of Bethlehem, arrested Mohanad Abed al-Baset Shawabkah (25). At approximately 00:30 on Sunday, 11 June 2017, Israeli forces moved into Silwan village, south of occupied Jerusalem’s Old City. They then deployed in ‘Ain al-Louza neighborhood and discriminately fired rubber-coated metal bullets towards civilians’ houses under the pretext of burning a vehicle belonging to Israeli settlers in the abovementioned neighborhood. ‘Emad al-Qaq stated to PCHR’s fieldworker that the Israeli forces moved into many neighborhoods in Silwan village and fired rubber-coated metal bullets in the neighborhood. Moreover, a group of Israeli settlers deployed in the neighborhood under the protection of the Israeli forces. The settlers insulted the neighborhood’s residents under the pretext that the residents burned a vehicle belonging to the settlers. Al-Qaq also said that a rubber-coated metal bullet penetrated his house window and broke it. At approximately 03:00 on Sunday, Israeli forces moved into Beit Haninah neighborhood, north of occupied Jerusalem. They raided and searched a house belonging to the representative Of Islamic Bloc in Birzeit University, Yaser Abu Ramilah (23) and arrested him. At approximately 21:00 on Sunday, Israeli forces moved into Baten al-Hawa neighborhood in Silwan village, south of occupied East Jerusalem’s Old City. They raided and searched a house belonging to Iyad al-‘Abasi and arrested his son ‘Adnan (15). 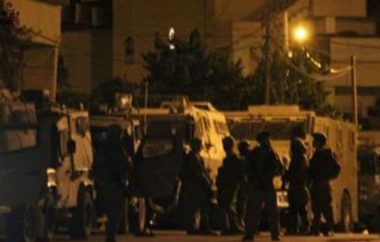 At approximately 01:00 on Monday, 12 June 2017, Israeli forces moved into Wadi al-Jouz neighborhood, east of occupied East Jerusalem’s Old City. They raided and searched houses from which they arrested Wisam al-‘Ouri (20), Majd Sa’idah (21), Yehia ‘Ajalouni (19) and Fawzi ‘Ashour (20). At approximately 01:00 on tueasday, 14 June 2017, Israeli forces moved into ‘Ein al-Lozeh neighborhood in Silwan village, south of Jerusalem’s Old City. They raided and searched a house belonging to the family of al-Shyoukhi. They arrested Mo’az (27) and Mansours al-Shyoukhi (25) and later withdrew taking them to an unknown destination. At approximately 15:30 on Tuesday, 13 June 2017, a special force of Israeli soldiers assaulted ‘Abed al- Hay al-Zair (60) while he was in front of his house in al-‘Abasiyia neighborhood in Silwan village, south of occupied Jerusalem’s Old City. The Israeli soldiers assaulted ‘Abed al-Hay under the pretext that he assaulted the soldiers while on duty. As a result, ‘Abed al-Hay sustained fracture to the right arm. Abed al-Hay said that the Israeli forces arrested him along with his son Ahmed (15) under the pretext that they assaulted the Israeli soldiers while raiding Silwan village. He also pointed out that the Israeli forces released him while his son is so far under arrest in order to bring him before the court. Al-Zair also said that the Israeli forces accompanied by military vehicles carrying special forces and Israeli Intelligence forces moved into al-‘Abasiyia neighborhood in the vicinity of his house. Abed al-Haiy said that he was sitting in the yard near his house when the Israeli soldiers raided the area. During this, an Israeli officer asked him to come and open some doors adjacent to his house. ‘Abed al-Hay said to the officer that these doors are the doors of the neighbors’ houses. The officer told him” If you do not open the doors, I will fracture your hands”. Abed al-Haiy added that “I had keys of my car, house and workplace so the officer asked me to give them to him and again ordered me to open the doors”. In the meantime, my son Ahmed was sitting in my car in front of my house and then the Israeli soldiers headed toward him taking him out of the car and severely beat him. When I attempted to help my son, they beat me as well and fractured my arm. Al-Zair said that the Israeli forces took him and his son Ahmed to the Salah al-Din Street police station. During that time, he lost consciousness because of the severe pain he suffered. Despite his screams and pains, the soldiers detained him until evening hours. He was subjected to naked search and insulted him and his son. At approximately 01:00 on Wednesday, 14 June 2017, Israeli forces moved into al-‘Issawiyia village, northeast if occupied East Jerusalem. They raided and searched houses from which they arrested Mohamed Samer Mahmoud (15), Shaker Amjad Mostafa (17), ‘Abed al-Fattah Abu Siyamah (16), and Mohamed ‘Alaa Mahmoud (17). The Syrian regime and Russian warplanes continue to bombard the Daraa refugee camp and neighbouring towns with barrel bombs, rockets and mortars. Witnesses said the regime’s aircrafts carried out more than 14 explosive barrages against the camp and areas in the town of Dara’a while its forces fired more than 11 rockets at the city. This coincided with the outbreak of “violent” clashes between the Syrian regime forces and opposition groups which resulted in the death and injury of a number of people. The camp and surrounding areas have witnessed a surge in military action since the beginning of June, with the aim of controlling the area. Israel’s parliament moved forward today with a bill that would see the government cease to transfer an estimated 1 billion shekels ($280 million) per year to the Palestinian Authority (PA) over the controversial “martyrs” compensation programme that provides financial allowances to Palestinians imprisoned by Israel and their families. Israeli media reported that the Knesset plenum approved a preliminary reading of the bill, with some 48 Knesset members voting in favour of the bill and 13 opposing it. During the reading, Israel’s Deputy Defence Minister, Eli Ben Dahan, said: “It cannot be that with one hand, they [Palestinians] seek to make peace with Israel, while they continue to fund terrorists with the other,” according to the Times of Israel. Issa Qaraqe, head of the Palestinian Committee of Prisoners’ Affairs, told Haaretz. Gaza, which has often been compared to an “open air prison” for its 1.9 million inhabitants crowded into 365 square kilometers, has suffered from a decade of isolation and deprivation, made all the worse by three devastating Israeli military operations, and persistent intra-Palestinian political strife. The recent decision by the Palestinian Authority (PA) to request that Israel reduce its supply of electricity to the Gaza Strip has made many fear that the situation in Gaza could soon reach a political and humanitarian breaking point with unforetold consequences. Six months after Israel evacuated its illegal settlements in the Gaza Strip, the Hamas movement won Palestinian legislative elections in January 2006 by a landslide, scoring 74 seats in the Palestinian Legislative Council (PLC), while Fatah, the ruling party of the PA, won a mere 45. Deplored as a “tsunami” by Fatah officials at the time, the elections sparked tensions between Hamas and Fatah, amid Israeli and American economic sanctions against the PA, as the two countries consider Hamas to be a terrorist group. The tensions culminated in the Battle of Gaza between June 10 and June 15, 2007, during which Hamas wrestled full control over the coastal territory, prompting Israel to impose a full-scale military blockade of Gaza. In the decade since, Israeli authorities have severely restricted Gazans’ freedom of movement, requiring that all Palestinians — including medical patients in need of treatment, businesspeople, and elderly worshipers — obtain permits in order enter or exit through the Erez border crossing. Egypt, the only other country sharing a border with Gaza, has also upheld the blockade since Abd al-Fattah al-Sisi overthrew the Muslim Brotherhood-led government in 2013 and became president. Egypt also recently attempted to pressure the Gaza government into cooperating with its harsh ‘counterterrorism’ crackdown in exchange for providing some direly needed electricity. Israel has also maintained stringent restrictions on goods allowed inside the besieged enclave, arguing that construction material such as cement could be used by Hamas and other Palestinian resistance groups for military purposes. Israel Defense Ministry files released in 2012 also revealed that Israeli authorities had also restricted the entry of food into Gaza, with items such as cardamom, chocolate, and potato chips listed by legal NGO Gisha as being prohibited from import into Gaza in 2010. Meanwhile, Gaza’s agricultural sector have been negatively affected by Israel’s loosely defined “buffer zones” on both land and sea, as Palestinian fishermen and farmers risk their lives should they get too close to the border fence or stray away from the small “designated fishing zone” off the coast of Gaza. Israel has cracked down on Palestinian resistance in the Gaza Strip over the years, claiming that rockets sporadically fired from the small Palestinian enclave and tunnels built between Gaza and Israel or Egypt justify the imposition of punitive measures on Gaza. While the tunnels between Gaza and Israel are used by resistance groups seeking to target Israel, the tunnels with Egypt are used by Hamas as a source of tax revenue and inflow of weapons, and also supply highly demanded necessities for Gazans, including food, medicine, and much-needed infrastructure materials. The already stringent blockade has only seen its impact multiplied by several large-scale Israeli military operations in Gaza in the span of ten years, in which Israel has been accused of indiscriminate use of force that rights groups have said amounts to war crimes. During Operation Cast Lead, a three-week war which began in late December 2008 and ended in January 2009, 1,391 Palestinians were killed — 926 of them civilians — and more than 5,000 were wounded, according to the Palestinian Center for Human Rights (PCHR). Meanwhile, 13 Israelis were killed — four of whom by friendly fire — and 518 were wounded. In November 2012, Israel’s one-week military strike known as “Operation Pillar of Defense” left 160 Palestinians killed and 1,000 injured, according to PCHR, while the Israeli government stated that six Israelis were killed and 229 were wounded. The most devastating conflict, however, took place in the summer of 2014, when a seven-week war claimed the lives of 2,310 Palestinians, 70 percent of them civilians according to the Gaza Ministry of Health, and wounded more than 10,500 others. Meanwhile, 72 Israelis, 67 of them soldiers, were killed, and 555 were wounded. Hamas has not claimed responsibility for any rocket attacks since a ceasefire was declared after the 2014 war, and the movement has attempted to clamp down on armed activity by smaller political groups that do launch rockets from the territory. Israeli officials have nonetheless accused Hamas of “preparing” for another war with Israel and have threatened retaliatory measures against the Gaza Strip as a whole — notably carrying out airstrikes in 2016 and earlier this year — while Israeli authorities hold Hamas responsible for all attacks against Israeli targets coming from the Gaza Strip. The three Israeli offensives caused extensive damage to Gaza’s water, sanitation, energy, and medical infrastructure, and destroyed thousands of homes, whose reconstruction has been seriously stalled by the Israeli limitations put on the import of material, as well as the slow disbursement of international aid. As of August 2016, some 50 percent of the buildings that were completely destroyed during the devastating 2014 war were still awaiting reconstruction, while an April 2016 UN report estimated that 75,000 Palestinians were still homeless nearly two years after the latest war. Touting one of the world’s highest unemployment rates at 44 percent, an estimated 80 percent of Gaza’s population is dependent on humanitarian assistance. In 2015, the UN warned that the Gaza Strip could become “unlivable” by 2020 if nothing was done to improve the situation, but recent developments have led many to fear that the deterioration of living standards could take place much more quickly than expected. While Gaza had struggled for years with power shortages due to limited fuel access and degraded infrastructure, Gaza’s sole power plant shut down in April, as Gaza’s electricity officials saying they could not afford a PA-imposed tax on diesel fuel that doubled the price of operating the plant. As a result, Gazans went from eight hours of electricity a day down to three or four. Meanwhile, Israel’s decision to implement PA-request limitations on power supplies, as the PA accused Hamas of failing to transfer electricity payments, could further reduce access to power by half. A group of 16 civil society organizations urged Israeli authorities on Wednesday to reconsider limiting electricity output to Gaza, slamming the decision as “unrelated to concrete security needs” and “political in nature,” therefore in violation of international law. “Israel cannot claim to be only a service provider, responding neutrally to a client’s request. Given its extensive control over life in the Strip, Israel is responsible for enabling normal life for its residents, as an occupying force in the Strip,” the groups said. Access to health care has been heavily impacted by the blockade, power shortages, and PA budget cuts, putting hundreds of patients’ lives at risk. “The health sector is able to provide only the absolute minimum standard of care — hospitals are being forced to cancel some operations, are cutting back on maintenance, and are dependent on the United Nations for emergency fuel to run their generators,” UN Special Rapporteur on the human rights situation in the occupied Palestinian territories Michael Lynk said on Thursday. Lynk added that, with water treatment plants in Gaza functioning at approximately 15 percent capacity due to the power shortages, sewage was pouring untreated into the Mediterranean Sea, and access to drinking water in Gaza was becoming scarcer. Lynk also warned that the cost of living essentials, such as food, was increasing, while increased electricity cuts were forcing companies to close or reduce hours, leading to even higher unemployment. In the span of a decade, the Hamas-Fatah rivalry has continued unabated, with recent moves by the PA further exacerbating the dire living conditions in Gaza. Tensions have only escalated in recent months over the ongoing electricity crisis in Gaza; accusations of politically motivated arrests in both the West Bank and Gaza; PA-imposed cuts to the salaries of civil servants in Gaza; and the occurrence of local elections only in the West Bank, despite being boycotted by Hamas and other parties. During its decade in power in Gaza, Hamas has been denounced for its violations of human rights, including its use of the death penalty, notably against people accused of “collaboration” with Israel, and its crackdown on dissident voices. Israeli news outlet Ynet reported on Wednesday that a PA statement marking the decade anniversary of the blockade blamed Hamas for the situation in Gaza. Lynk, the UN special rapporteur, criticized Israel, the PA, and Hamas for having “a direct hand in the crisis,” and urged them all to act for the well-being of Gaza residents. “I call on them to put aside their differences, live up to their legal and political obligations, and to ensure that electricity needs are fully met, with immediate critical infrastructure requirements addressed,” he said. While UN Humanitarian Coordinator in the occupied Palestinian territory Robert Piper characterized the ever-worsening crisis in Gaza as “an internal Palestinian dispute” on Wednesday, rights groups have placed the bulk of the blame on the Israeli siege. A senior Israeli official stated that Jason Greenblatt, U.S. President Donald Trump’s envoy on the peace process, will come to the region soon to meet with Prime Minister Benjamin Netanyahu in Jerusalem and with Palestinian President Mahmoud Abbas in Ramallah. The official said that the visit may take place next week or right after Ramadan ends June 24. A senior American official confirmed that Greenblatt is trying to schedule a visit but that a final date has yet to be finalized, Haaretz Hebrew newspaper reported on Wednesday. Israeli and Palestinian sources said that the Americans would like Netanyahu and Abbas to present their stances on the core issues up for negotiations: borders, security, refugees, Jerusalem and the settlements, so they can map the differences and decide whether, and if so how, to draft a document that would delineate the principles along which the negotiations would be renewed. Haaretz quoted the Israeli official as saying:”The Americans have ideas and drafts for principles for the renewing of the negotiations,” said an Israeli source informed with the details of the negotiations between Israel and the Palestinians. “The White House made preparations and held consultations with a number of people in order in order to map the positions of the sides and the talks with Netanyahu and Abbas are a part of this process”. A senior Palestinian official said that Abbas and his advisers view positively the administration’s efforts to deal with the side’s positions on the core issues and not just on the current issues regarding the state on the ground. According to the official, the Palestinian side is still not considering the consultations with Trump’s Middle East peace envoy, Jason Greenblatt, next week as the beginning of a new round of negotiations, but rather they view it as a stage in which the Trump administration is determining how it means to renew the talks. A recent Israeli television report said that Trump wants to resume peace talks as soon as possible, and is interested in first narrowing the gaps between the sides before beginning talks on issues of substance. The Palestinian official stated that during his meeting with Abbas in Bethlehem several weeks ago, Trump raised the idea that the Palestinians and Israelis each send five-person teams to Washington to get started with the negotiations. According to him, the Palestinians view this positively and are waiting for the end of Ramadan in order to try and reach a date for sending a delegation to Washington. Two weeks ago, Haaretz reported that the Trump administration is considering drafting a document that would delineate the solutions to the core issues according to which the negotiations between the Palestinians and Israelis would take place. 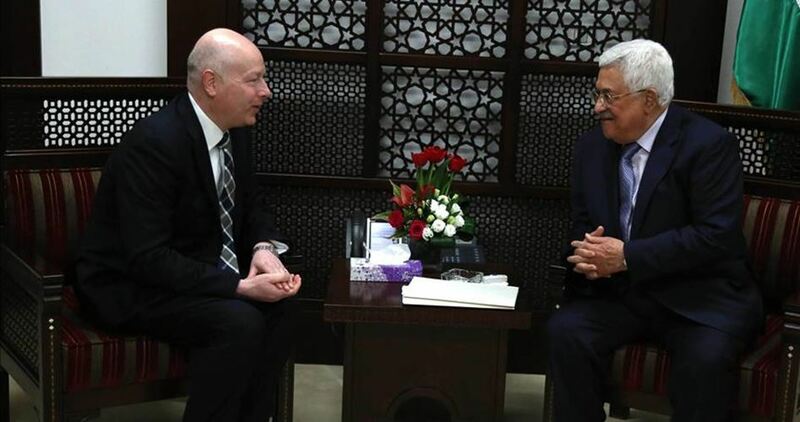 The White House has yet to decide on this issue, but both Israel and the Palestinians believe that Greenblatt coming to map the two sides’ positions is in preparation for the drafting of this document. Prime Minister Benjamin Netanyahu hinted in a meeting of his Likud party two weeks ago that the White House may present a statement of principles for the renewing of negotiations. “The current administration has a strong will to put something on the table,” he said in a closed meeting of Likud lawmakers in the Knesset. “We have many positions that are important to us, and this doesn’t mean that what we tell them is acceptable to them”, he added. 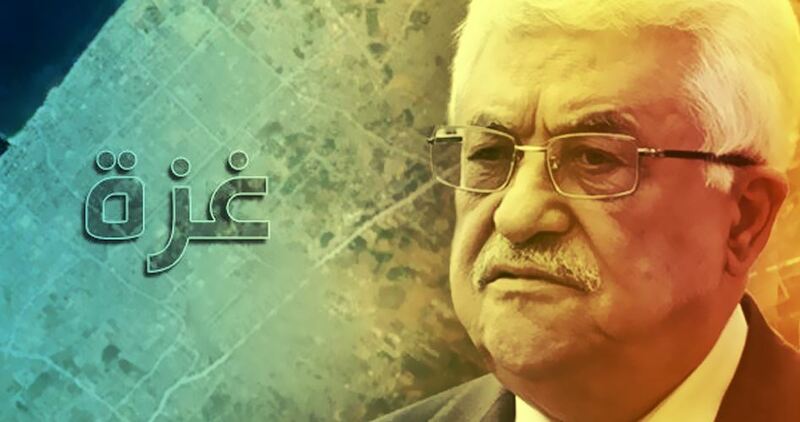 Israel Hayom newspaper said Thursday that Palestinian Authority (PA) chairman Mahmoud Abbas mulls declaring Gaza Strip a rebel district soon. The paper quoted a senior PA official close to Abbas as saying that the move, a “doomsday weapon” for Abbas to use against Hamas in the internal Palestinian conflict. The move aims at pressuring Hamas to hand control of Gaza over to the Palestinian Authority, according to the official. In such an event, Hamas would be outlawed and all its assets, including institutions, funds and bank accounts, will be frozen. In addition, arrest warrants will be issued against the heads of the organization. Likewise, the Palestinian Authority will cease paying the salaries of public servants in Gaza, and will ask the U.N., the Arab League and various international bodies to discontinue international aid to Gaza. The PA would also petition the Palestinian Supreme Court, seeking to declare the Palestinian parliament illegal, thereby revoking lawmakers’ diplomatic immunity, disbanding the government and paving the way for an interim government for as long as the state of emergency continues. The Palestinian official stressed that the assessment in Ramallah is that such a move would have far-reaching diplomatic implications, going beyond the internal Palestinian conflict. First and foremost, they believe this will pressure Israel, the U.S., Egypt, Jordan and others to kick start the stalled peace process between Israel and the Palestinians. According to the Palestinian official, security and political officials in Israel were recently briefed about Abbas’ plans, and signaled that Israel did not support the action at this time. The Israelis would like to first exhaust all other avenues, under the auspices of regional and world powers, to resolve the Gaza crisis. An official in Abbas’ office in Ramallah said that since this kind of action is unprecedented, it is yet unclear how it would be implemented practically, or whether or not it is even possible under Palestinian and international law. However, it is clear that Abbas has already fired the opening salvo as evidenced by cutting the wages of public servants in Gaza, freezing the salaries of a number of Palestinian parliament members representing Hamas and halting payments to Palestinian prisoners freed in the 2011 Shalit prisoner exchange deal. The official said that a team of Palestinian Justice Ministry legal experts has been established to review how to implement the plan legally, both in terms of Palestinian law and international law. The Islamic Resistance Movement, Hamas, warned on Wednesday that Israel’s tough policy towards Gaza does not have an impact on the Palestinians alone, Anadolu has reported. “Israel’s policy in the Gaza Strip is leading the Israelis themselves into a cul-de-sac,” said spokesman Sami Abu Zuhri. If the oppressive measures spark off another military offensive against the people of Gaza, as has been predicted, Hamas believes that it will have an impact on the whole region. Abu Zuhri’s remarks came in the wake of the Israeli cabinet’s decision to reduce electricity supplies to the besieged territory. He called on the international community to take the necessary measures towards such policies. Prior to this, the Fatah-led Palestinian Authority in Ramallah announced that it had officially asked Israel to cut electricity supplies to Gaza. The situation, said Israeli Prime Minister Benjamin Netanyahu, is completely related to a dispute between Hamas — the de facto government in Gaza — and the Ramallah-based authority. Israeli media reported on Tuesday that there are EU and Egyptian efforts underway in a bid to resolve the electricity crisis in the Gaza Strip, but nothing has emerged so far. A Palestinian activist in the Gaza Strip has launched an initiative to provide free medicine and medical treatment for poor patients in the besieged territory. Adel Zo’rob, 46, said that the Seed of Goodness initiative appeals to people to donate medicines and medical treatment and other medical services for patients who cannot afford them. In an interview with Quds Press, Zorob explained that the idea for the scheme emerged almost a year ago when he appealed through his Facebook account for people to donate medicine for one needy person. “The appeal received good reactions and many people contacted me to donate the medicine and cover the treatment costs, including surgery which the patient needed at the time,” he explained. Zorob said that he wants to expand the initiative by creating a pharmacy that provides necessary medicine for the poor free of charge. Seed of Goodness has helped 1,500 patients this year, by providing medical treatment, medical supplies and wheelchairs. “The project is important in light of the difficult economic conditions experienced by the residents of the Gaza Strip and the tightening of the siege,” said one of its beneficiaries, Iyad Zubaydah, 44. Another beneficiary, Hassan Mohammed, 31, told Quds Press that he was able to secure an essential drug for the wife of his cousin who was pregnant and needed the medicine to save her unborn child. According to the Palestinian Central Bureau of Statistics, the unemployment rate in the Gaza Strip reached 41 per cent during the first quarter of 2017. Unemployment rates in Gaza are believed to be among the highest in the world. Israel has imposed a strict siege on the Gaza Strip for 11 years. Updated: Israeli soldiers invaded, on Thursday at dawn, many Palestinian homes in the West Bank governorates of Hebron, Bethlehem, Nablus and Qalqilia, and abducted nine Palestinians, the Palestinian Prisoners’ Society (PPPS) has reported. The Hebron office of the PPS, in the southern part of the occupied West Bank, said the soldiers abducted four Palestinians, including former political prisoners. They have been identified as Anas Ibrahim Shadeed, Morad Qawasmi, Mahmoud al-‘Oweiwy and Safwat al-Ja’bari. They have been identified as Anas Ibrahim Shadeed, Morad Qawasmi, Mahmoud al-‘Oweiwy and Safwat al-Ja’bari. In Bethlehem governorate, the soldiers invaded Beit Sahour, east of the city, and abducted Raed Ibrahim Obeyyat, 38, from his home, after breaking into it and searching it. Also in Bethlehem, the soldiers abducted Bilal Ismael Masalma and Ahmad Obeidallah, from their homes in the city. Furthermore, the soldiers invaded Qalqilia city, and nearby Azzoun town, in northern West Bank, and abducted Jamal Jamil Daoud, 20, and Yahya Abdul-Salam Salim, after breaking into their homes and searching them. In Nablus, in northern West Bank, the soldiers invaded Rafidia area, searched a few homes and abducted Farouq Nabil al-Bishtawi.